Huawei Mate 8 Unboxing & First Impressions! 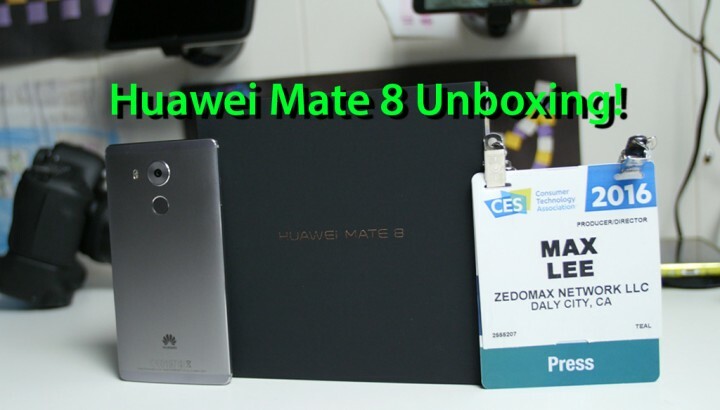 At CES 2016, Huawei announced the Huawei Mate 8 officially and gave out a review unit to everyone who attended their press conference. Well, I finally got back from CES and wanted to put my full attention to unboxing and giving you my first impressions. The Huawei Mate 8 comes with Huawei’s own Kirin 950 processor that scores much higher than Note 5’s Exynos processor in benchmarks. It’s certainly a step in the right direction and that’s probably what’s most exciting on this phone. Of course, don’t forget that the Mate 8 also supports 2 SIM cards and comes with a microSD card slot. A lot of what Samsung did wrong with Note 5 and S6, Huawei got them right minus the internal battery. I should have a full review of this bad boy but for now the only thing I am disappointed with the Mate 8 are lack of 4K video recording and 1080P screen. While every other flagship smartphone does 4K, Mate 8 does not have 4K option. But not all is lost, the video recording has excellent OIS and its F2.0 lens seems to do fantastic job nevermind it also does 1080P 60fps. As for screen, the 6-inch screen on Mate 8 should have a 1440P screen for the best viewing experience as even smaller phones like Galaxy S6, Note 5, and LG G4 all have it. Design is excellent on this phone, I don’t think it can get any better and the metal unibody feels great in the hands. I will have to try the phone out more obviously but for right now, I would have to say it’s not bad considering it’s the fastest smartphone you can buy “right now”. If you are on the fence about getting this or the Nexus 6P, I would probably get the 6P if you need 4K and 1440P screen but if you don’t mind 1080P video and screen, the Mate 8 is definitely the best choice. Next story T-Mobile Binge On Throttles! & How To Turn Off Binge On! Previous story Top 10 Best of CES 2016!